Description: The Fisher-Price Choo-Choo is an 8-piece Original Little People playset that includes a 4-piece wooden train and 4 straight-sided Original Little People figures. The train and figures are the same as those sold in the much sought after 1963-1965 #932 Amusement Park. All of the pieces sold in this set are hard to find. QWW - Light blue straight-sided boy with red heat-stamped hair and a smiling face. BRWW - Green straight-sided boy with a smiling face, red freckles, ''' eyebrows, and no hair. GKWW - Red straight-sided girl with a red heat-stamped bow and hair, fancy eyes, and a smiling face. HOWW - Black straight-sided dog with a pointed face and white droopy ears. This dog was also used in the #932 Amusement Park. He looks like the dog that was used in the early version of the #969 Ferris Wheel, except this dog is slightly shorter. *See "Variations" below. The plastic base on the engine and cars can be either yellow or white. The Fisher-Price dealer catalogues picture the train with alternating color bases: the engine has a white base, the following car base is yellow, the next car base is white, and the final car base is yellow. FPT692 - Engine - Small train engine with a red wooden body, a blue wooden smoke-stack, a white plastic base and front grill, and a white peg on the back that any of the 3 cars can hook to. It has a yellow plastic cab roof that tilts back to reveal a seat for a passenger/engineer inside. 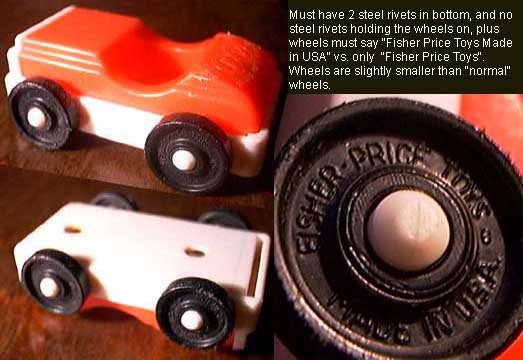 The wheels are attached with white plastic knobs/axles. FPT691 - Engine - Small train engine with a red wooden body, a blue wooden smoke-stack, a yellow plastic base and front grill, and a yellow peg on the back that any of the 3 cars can hook to. It has a white plastic cab roof that tilts back to reveal a seat for a passenger/engineer inside. The wheels are attached with yellow plastic knobs/axles. FPT698 - Small blue wooden train car with a white plastic base and ends. FPT699 - Small red wooden train car with a white plastic base and ends. FPT700 - Small yellow wooden train car with a white plastic base and ends. This set was sold in a 10-5/8" long, 2-1/4" high, 2" wide open display package.